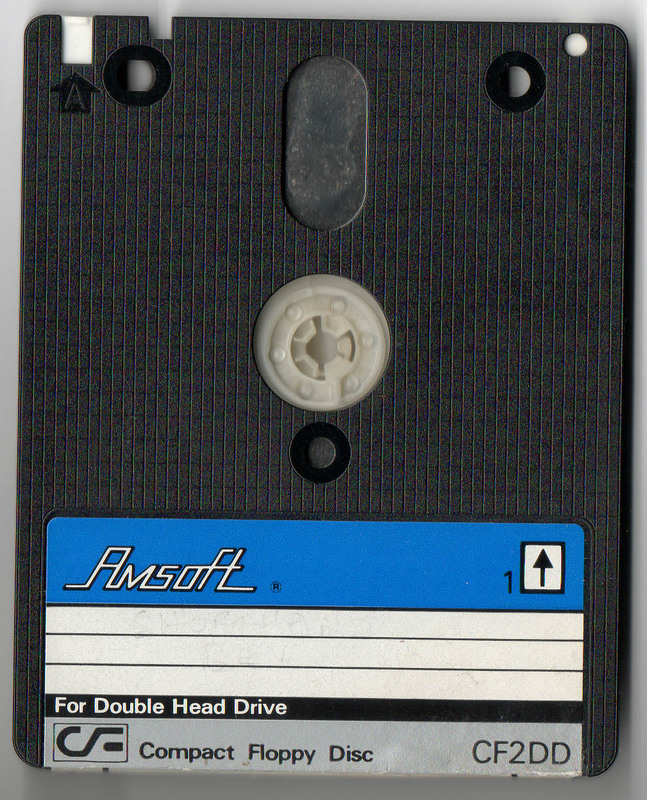 The 3" discs for the Amstrad Disk Drive are called CF2 (Compact Floppy Disc). CF2 discs were produced by AMSOFT, MAXELL, Schneider, Panasonic. In late eighties, cheaper Noname discs were also available (although these were rather unreliable). Capacity is 180 Kbytes per side (the discs can be flipped to access the other side, giving a total of 360 Kbytes per disc). 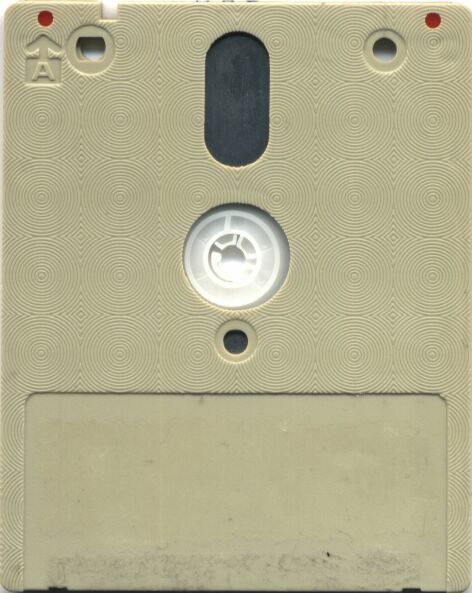 In 1982 to 1983, there were some "microfloppy" formats competing to replace the 5¼″ floppy. However, in 1984 Apple choose the Sony 3½″ drives for their Macintosh computer. The Sony format became the de facto microfloppy standard but other formats, including the Hitachi 3″ and the 5¼″ still had plenty of life left in it. In 1987 IBM choose 3½″ in PS/2 PC architecture. Alan Sugar, sign a deal with the manufacturers of three-inch disk drives to sell him units at a fixed percentage beneath the lowest-priced 3.5-inch drive, he got the cheapest option going for generations of computers. In 1985 a CPC computer appeared with 3" floppy. Towards the end, it was rumoured, Hitachi had to keep a factory going just for Amstrad — it lost money on each drive, but not as much as if it had broken the contract—. 3" format saw its finest hour in the PCW range of CP/M word processors which sold by the million: its passing leaves the world with a legacy of documents. PCW 8000 drive B or 9000 series drive A can handle the DD format (720k). Spectrum +3 bios can handle too if you add one of those PCW CF2-DD units (or 3,5" drive). Some CPC utils and ROMS would use PCW format (Knife) or PC DOS FAT12 720k format (BonnyDOS) (SymbOS). There is not much to be said about these 3 inch discs other than there is only one type but produced by a number of different manufacturers -- some good quality, many bad quality. I have identified what the years have shown me to be good quality, long lasting discs but beware do not judge the discs you might be offered by their paper labels as many cheap copies from suspect makers have appear in the market place, look at the discs themselves. 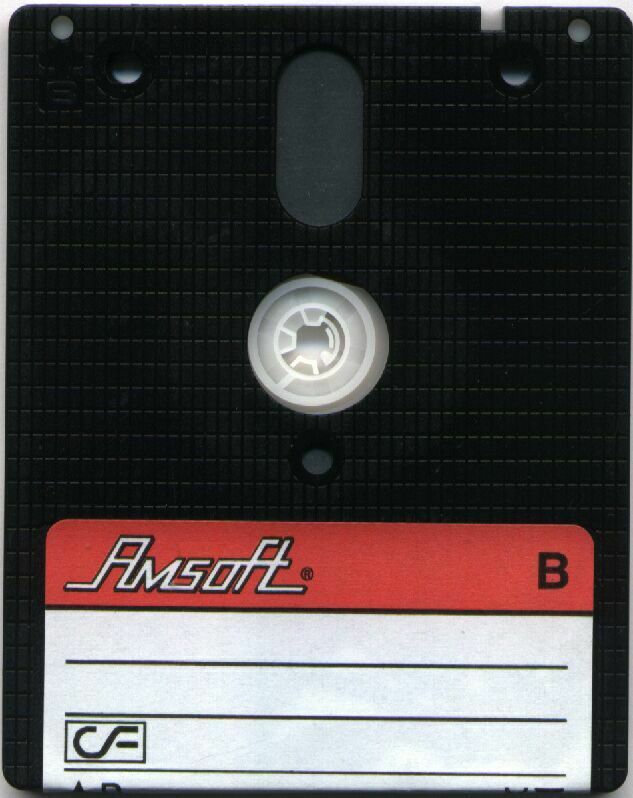 Genuine Amsoft (Amstrad) 3" CF-2DD: This type of disc was originally supplied for the double head 720K drives at an enhanced price, then Amstrad admitted that these discs were no different to their other offering (see the first disc). Dixions Store supplied: Found to be unreliable and not to servive the rigours of time -- to be avoided at all costs! Maker Unknown - Blank6 & Blank11: These discs are found to be unreliable and do not last the rigours of time -- to be avoided at all costs. Copy (or poor quality) Amsoft: These discs normally come with an Amsoft label and I am lead to believe that they are cheap copies -- to be aviod at all costs. These discs tend to become corrupt and or fall to pieces. Wiz Disc: Origin of manufacture is unknown but a test of six discs from the same batch revealled that most would not format to 720K but were fine at 180K -- to be avioded at all costs. Diskxpress: Supplied by Diskxpress -- to be avioded at all costs. A look-a-like Maxell 3: Poor quality, jams in drive. Note no serial number on side 'B' unlike the Maxell disc it is trying to copy! When John King has told me about using CF-2DD discs as standard CF-2 discs for the first time after I've purchased one of them (with the Blue label) back in Friday 2nd April 2004 as a souvenir as well purchasing other Amstrad CPC / PCW stuff from him (I was his regular customer, always calling him to reserve the items for me to collect after I've checked out his web site and then I travel 2 - 3 hrs by train, checking / testing out the merchandise at his house when I got there, collect, paid him by cash and then make another 2 - 3 hrs back on my way home, I didn't care how far he lives or how heavy the items that I'm carrying on my way back, as long I got the items that I always wanted), I thought he was making it up, until when I got home and decided to tested out his own theory, it turns out that he is right along and it works perfectly. Then, I've tried the reverse order using any standard CF-2 discs as CF-2DD discs, and it turns out that I'm right as well, as it works perfectly - check out my "Re-using 3 Inch Floppy Discs with Bad Sectors" link to see what I mean. Those 3" floppies were known to be in chronic shortage... and for being far more expensive than other formats due to all the mechanical parts in them. In France they would sometimes cost about 4x or 5x times more than 5"1/4 or 3"1/2 (20-30 francs per piece instead of 5-10 francs for other formats, roughly)... They were supposed to have DD or HD version, but mostly only some PCW would use double sided disk drives with special format not quite compatible with simple sided disk drives. 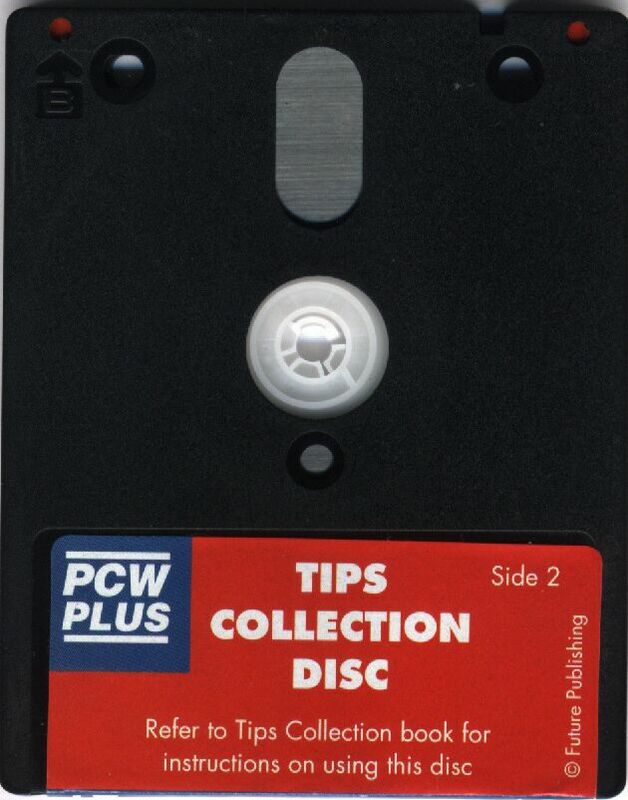 That the PCW, a professional computer, would use those too in large number would create the shortage, as companies wouldn't mind bying bulk stocks of such floppies. The snoty CPC gaming user (or Speccy+3) would really have to think twice at what content he would put on those. Also the price of the disks would have impact on game devs and producers, as they would rarely aim at games using one whole or multiple floppies (6128 specific large games) because this could mean less profit, longer development time and only 6128 configs being able to launch games, the few amount of money spent on the floppies would quite render the game less profitable than small Tape oriented games (464 and 664 configs) that could be packed on one disk compilations. 16bit games would be sold at bigger price and would use far less expensive floppies anyway, so a game on 3-5 floppies would cost as much as a game on CPC on a full used disk in raw floppy material. A 3" disk could be somewhat 360ko in total, basically the same as a quite basic 5"1/4DD, except that you would have to flip side on a CPC. quite rapidly, the 3"1/2 went for DD in 720ko or HD in 1.44mo at quite lesser price per disk (the disk drive could be quite expensive on the other hand) which was more suitable for 16bit computers (those would at minimum sport 512ko of RAM most of time passed the Atari STfm release / after 1986). Some specific moded disk drives could perform special formats that were actually used as copy protection for some games, the most (only?) known exemple being Defender of the Crown on CPC. The french developper for the CPC version Brice Rive developped this specific method and went on to become UBIsoft copy protection specialist. He produced/coded Defender of the Crown, but also E.X.I.T and copy protection for various Ubi Soft prods on CPC. The story of this copy protection scheme was explained at CPCrulez french forum. The method consisted of moding some specific 3" floppy disk drives models so they could format the 3" floppies into something like 200-220ko per sides... Normal unmodified disk drives wouldn't be able to format disk the same way so the datas would need more floppies to be spread on and the copy, while still possible, would ask for many more disk switch and would render the game experience far less enjoyable. Cracked version of Defender of the Crown using 3 sides instead of only 2. Un-modified disk drives would still be able to read the specially formated floppies anyway (well, most of times I guess) and the extra sectors would not all be used actually. The situation with this 3" format was a dead end. Amstrad went for cheap arrangement in production and adventageous contract so they wouldn't upgrade to DD/HD (720ko per disk) because the disk drives would be too expensive, hence no proper use in larger RAM configuration would be viable, both in PCW or CPC (or speccy+3). So those 8 bit computers couldn't really benefit from upgraded games comparable to 16bit machines in content, and so on. Else it was a capable format, with somewhat robust floppies in elegant compact casings and quite fast disk access as well. CPC6128 was a pleasure to have. And by the way modern solution such as 3"1/2 disk drives or HxC floppy emulators are easily retro-fitable today. The nostalgia value from those 3 inchers is always touching anyway : the solid recomforting view of a brand brand new elegantly grided Amsoft CF-2 floppy in this sweet classic "mode1 palette" of Black-Grey-White-BrightRed, often rendered in many demos in sweet pixel art, is so emblematic of the CPC era to most of us old CPC664-6128-externaldrive users. It is integral part of the Amstrad CPC culture. The Good or The bad ??? This page was last modified on 9 December 2017, at 20:52.